TV show dates: November 2, 2017 — present. Performers include: Shemar Moore, Stephanie Sigman, Alex Russell, Jay Harrington, Lina Esco, Kenny Johnson, and Peter Onorati. Based on ABC‘s 1970s TV series and the 2003 feature film of the same name, the SWAT TV show on CBS is is a police action drama centering on on Sergeant Daniel “Hondo” Harrelson (Moore). A lifetime Los Angeles local and former Marine, Hondo has been tapped to lead a new “last stop” Special Weapons and Tactics unit. Because he is L.A. born and raised, Hondo feels deeply loyal not only to his “brothers in blue” but also to the people they serve. This makes him particularly qualified to lead the team and build a bridge between the force and the community. David “Deacon” Kay (Harrington) is a seasoned, competent officer. Although can’t help but feel overlooked for the top job, he is extremely loyal and committed to the team’s success. On the other hand, newcomer Jim Street (Russell) tends to be overconfident. Still, he has the potential to become a key player. Hondo’s tactical unit also includes canine trainer Christina “Chris” Alonso (Esco), a skilled officer in her own right. Then there is Dominique Luca (Johnson), whose driving expertise ensures the team is able to get into and out of risky scenarios. L.A. Metro Captain Jessica Cortez (Sigman), whose profession is her top priority, supervises the SWAT team. She and Hondo also have a personal relationship. Finally there’s Mumford (Onorati). Bold and self-assured, he heads up another L.A. unit and is certain of his own approach to situations. Although his group and Hondo’s are fierce rivals, they relish their competition. With Hondo at the lead, the SWAT officers are devoted to their jobs and are willing to lay down their lives to protect and serve. What do you think? Do you like the SWAT TV series? Should this TV show be cancelled or renewed for another season on CBS? DO NOT CANCEL S.W.A.T. !!!!! This is one of my absolute Favorite shows! I love Shamar and the rest of the cast, Not to mention the overall message of the series. This Country needs anything that encourages Family, community, unity & honor. Plain and simple. Please do not take S.W.A.T off. It is one of my favorite shows. The actors are great. Great episodes that make you want to stay and not miss any of the show while it is on. It just captivates you. If I do have to miss an episode, I’m watching it a few days later On Demand. One of the best shows on! 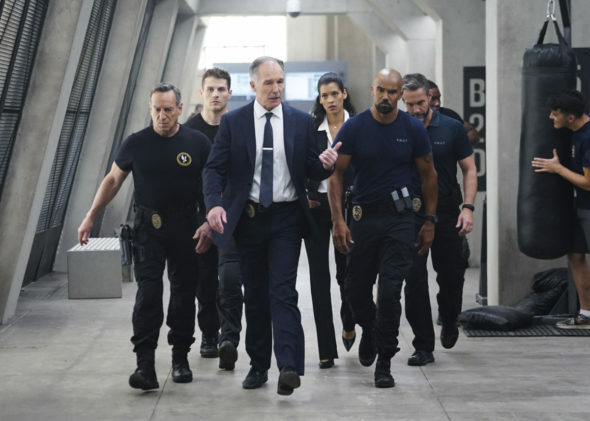 Please leave S. W. A. T. on for as many seasons as possible! I’m retired /Disabled law enforcement and I enjoy watching what I used to do on the job…. Brings back a lot of memories!! I LOVE SWAT PLEASE. DON’T CANCEL IT. IT IS A GREAT SHOW. This is a great show. Drama, personal, and love for those you work so close with. You manage to capture multiple elements which keep us glued to the screen. Please do not let Mumford go. He is such a hard nosed character himself who will sometimes show his softer side. He gives great balance to the team of characters who are all so different. He should remain part of the show. Plus he always adds a touch of challenge to the two teams which is always fun. Mumford is greatly loved and we would like to see him back on.